Good and friendly staff,especially thanks Katelyn and Lucas. Thanks for fixing the wifi problem. We appreciate it. Very good location and comfortable room. We’ll definitely come back again. The location is great. The room views are spectacular. Wonderful views and good location in Surfers Paradise. Comfortable apartment with a stunning view. Fully equipped kitchen. Steps away from the beach, shops and restaurants. Location is perfect - close to the beach, restaurants and shops. Our apartment was beautiful. Comfortable beds and pillows. Everything we needed in the kitchen. Full breakfast every morning was outstanding! Staff were very friendly and helpful with full customer service provided. Everything we needed was seen to! 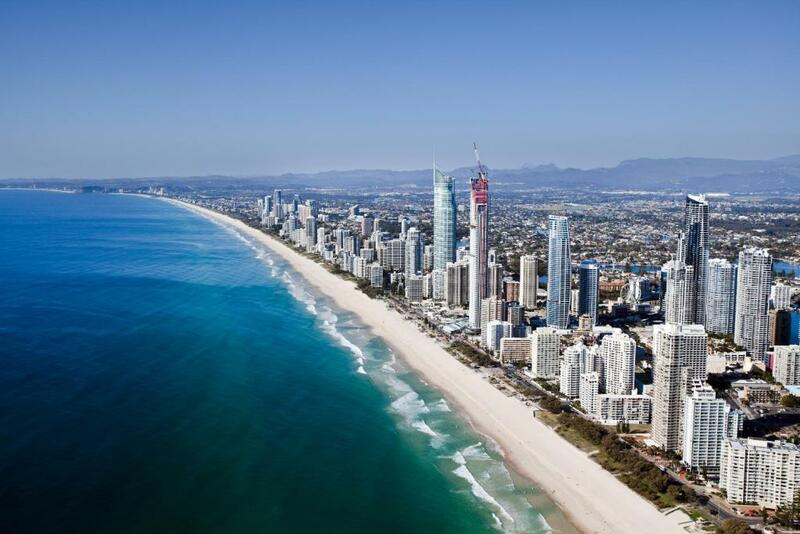 Lock in a great price for Hilton Surfers Paradise Residences – rated 8.3 by recent guests! Hilton Surfers Paradise Residences This rating is a reflection of how the property compares to the industry standard when it comes to price, facilities and services available. It's based on a self-evaluation by the property. Use this rating to help choose your stay! 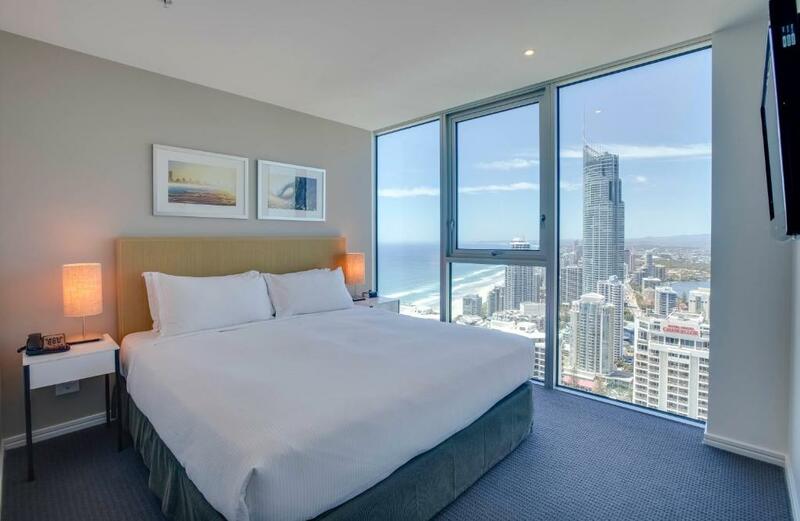 One of our top picks in Gold Coast.Located 350 feet from the beach, Hilton Surfers Paradise Residences offers luxury 1, 2, 3 and 4-bedroom apartments with panoramic views. Guests have access to a fitness center, indoor swimming pool, sauna and hot tub. In-room dining, valet parking, daily housekeeping and a 24-hour reception are available. All apartments at Hilton Residences Surfers Paradise include a separate living and dining area as well as a full kitchen with a refrigerator, freezer, electric stove top and a dishwasher. There is also a washing machine and a tumble dryer. The floor-to-ceiling windows provide views of the ocean, city or Gold Coast hinterland. In the building you will find Hilton's signature restaurant, Catch, serving a seasonal menu with Asian influences. There is also a cocktail bar, cafe and a spa for a massage or treatment. The tour desk can arrange sightseeing tours. Barbecue facilities are available for guests. 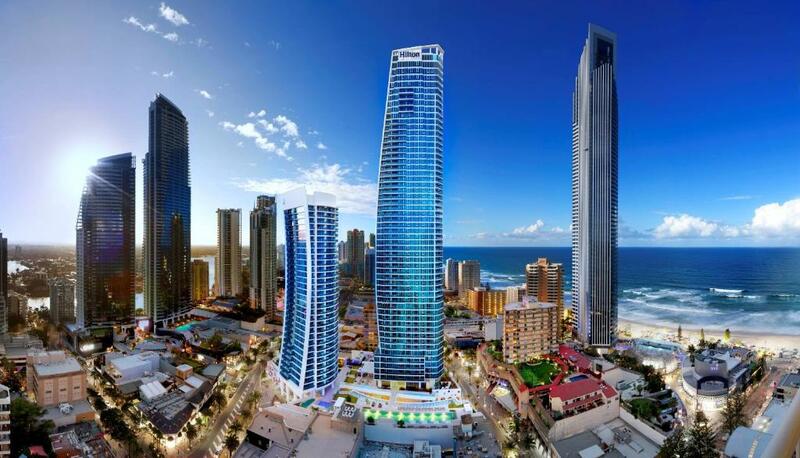 Surfers Paradise Residences Hilton is located in the center of the Gold Coast’s entertainment district. It is just 350 feet from the restaurants, cafés and bars of Cavill Avenue. 뀐 Located in the real heart of Gold Coast, this property has an excellent location score of 9.0! 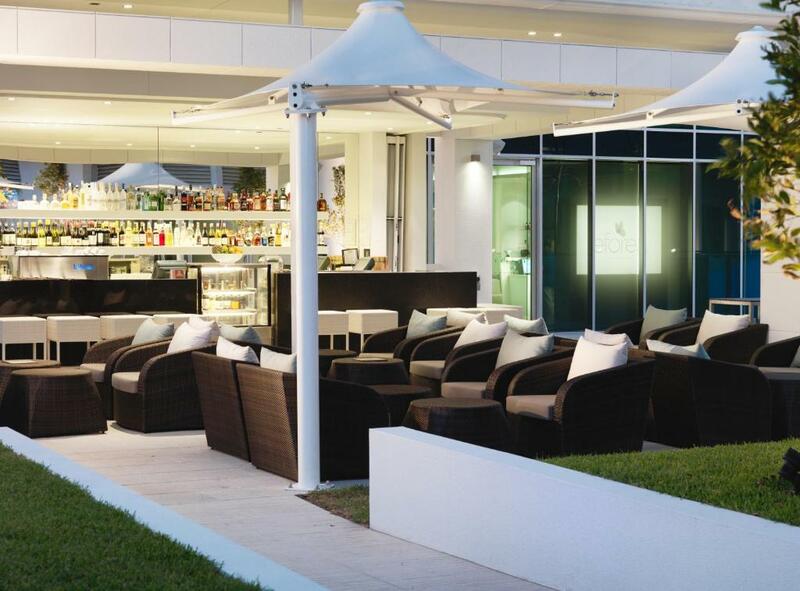 When would you like to stay at Hilton Surfers Paradise Residences? This 1-bedroom apartment has vast windows with beautiful views of the Gold Coast Hinterland and Surfers Paradise skyline. The spacious open plan layout has modern laundry facilities and a fully-equipped kitchen with state-of-the-art appliances. There is a king-sized Hilton Serenity Bed. Please note that the rate is based on 2 guests. Maximum occupancy is 3 guests using a sofa bed/rollaway bed (see Hotel Policies). Public parking is available on site (reservation is not needed) and costs AUD 20 per day. This 2-bedroom apartment includes a private balcony with views of the Gold Coast Hinterland and Surfers Paradise. It also includes a separate dining area and a fully equipped kitchen with an oven, stove top, refrigerator, dishwasher and a microwave. Housekeeping is provided after every 3rd day. Please note that the rate is based on 4 guests. Maximum occupancy is 6 guests using a sofa bed/rollaway bed (see Hotel Policies). Boasting panoramic windows with views of the ocean and Surfers Paradise, this stylish, spacious apartment includes a separate living and dining area, large balcony and bathroom and a modern kitchen with an oven, stove top, refrigerator, dishwasher and a microwave. 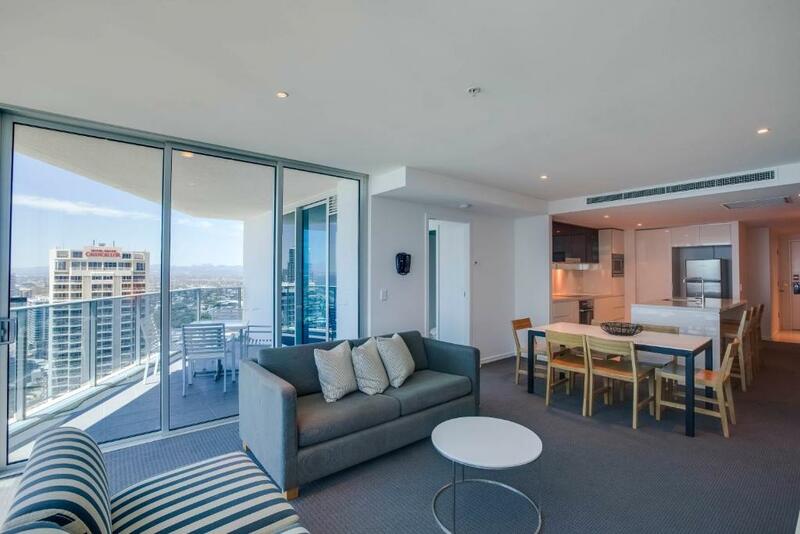 This 3-bedroom apartment features a private balcony and panoramic views over Surfers Paradise. It includes 2 bathrooms, vast windows and an open plan layout with separate living and dining areas. The modern kitchen includes an oven, stove top, dishwasher, refrigerator and a microwave. This spectacular Four-Bedroom Deluxe Ocean view apartment offers a fully equipped kitchen complete with Miele appliances, which overlooks the generous living and dining areas. It features views of the ocean and Surfers Paradise. The master bedroom with private bathroom can transform into a room with 2 single beds. 3 additional double rooms offer more space and privacy. Amenities include a washing machine, dryer and laundry tub, and you can stay entertained with a 37-inch TV and iPod docking station. Special touches include fluffy bathrobes, slippers and magazines. Experience the sheer indulgence in this breathtaking four-bedroom sub penthouse apartment. This stylish apartment features immaculate design and awe-inspiring views of the Pacific Ocean. It provides separate living and dining areas, a fully equipped laundry, and kitchen with De Longhi appliances. It offers designer furniture and art pieces, built-in surround sound, and state of the art mood lighting. This upper floor apartment features striking views, a full kitchen and a private balcony. On the upper floors of the hotel, 33 and above, this apartment has laundry facilities, separate living and dining areas, private balconies and large bathrooms. This stylish and spacious apartment offers ocean views from the balcony and lounge area. It includes a kitchen, laundry and separate living and dining areas. The kitchen has an oven, stove top, dishwasher, microwave and a refrigerator. Ideal for families, groups and holidaymakers the Hilton Surfers Paradise Residences offer all the facilities and services of an upmarket hotel, combined with the added comfort and convenience of self-contained apartment style accommodation. The Hilton Surfers Paradise Residences are available for long and short stays, and contain full kitchen and laundry facilities and separate living spaces. They also feature large balconies with views of the ocean, Gold Coast Hinterland and Surfers Paradise skyline. Guests can choose from a range of leisure facilities including an award winning restaurant, bar, day spa, four heated swimming pools, an indoor hot tub and sauna, pool bar, two gymnasiums and a theatre. The Hilton Surfers Paradise Residences are conveniently located between Orchid Avenue and Surfers Paradise Boulevard, right next to the popular Cavill Mall. It is only one street away from Surfers Paradise beach and the G-Link LightRail station. In close proximity to famous Gold Coast theme parks, the hotel team will also take care of booking all your tours, tickets and transfers. The hotel is located in the heart of Surfers Paradise, beach, dining, shopping, nightlife, entertainment, beaches and theme parks are all in close proximity. House Rules Hilton Surfers Paradise Residences takes special requests – add in the next step! Hilton Surfers Paradise Residences accepts these cards and reserves the right to temporarily hold an amount prior to arrival. Please note that housekeeping service is only offered every third day. You can request extra housekeeping services at an extra charge. For more information, please contact the property using the contact details found on the booking form. Please inform Hilton Surfers Paradise Residences of your expected arrival time in advance. You can use the Special Requests box when booking, or contact the property directly using the contact details in your confirmation. Everything was excellent, staff were awesome,location outstanding. Will be staying again. That they moved us for last night. The bed was comfy. The ocean view was awesome. Location is very good. Plates etc left outside elevators for to long making the hallways smell . Slightly disappointed with old furniture - specifically lounges which were worn and stained. Location, facilities and staff were fantastic! The elevators sometimes we would get close to our floor then it would take us back down to the bottom , also no air con in there either with multiple people made it stuffy and hot. Found cockroach out side toilet. Sheet on the second bed room is shorter than the bed. Great location and concierge service. What's not to like We are definitely coming back to stay hopefully get the same room. The view, privacy with my partner, felt very welcome by staff, staff will go out of there way to help, and OMG our room it's was the best. We both felt very spoilt by the staff and we can not thank you enough for the best service we got. The location was absolutely spot on for what we wanted from our weekend away. We didn't want to bother with hiring a car, and we certainly didn't need to. We just walked out the front of the hotel and absolutely everything we needed was right in front of us. Bars, restaurants, shopping all within easy access.